Respected Secretary Zhang Xia, County Mayor Jiang Yaowen and all the leaders of the county government. From the moment I had been first invited to eco-city of Zhongfang by my friends from Zhongfang Red Cross Organization in 2007, I thoroughly fell in love with this beautiful city. In recent years, Zhongfang has experienced great changes of being from small to large, ordinary to elegant, rough to pretty. All these amazing changes made her getting more and more fascinating. These achievements are the combination of government leaders’ wisdom and strategic viewpoints, also reflected all our constructors’ enthusiasm and hardworking. Because I want to stay together with this piece of land all my life, I’d eulogize it as well as all the leaders and people here from the bottom of my heart. What’s more, I’d also eulogize the miraculous “Cap Mountain” that keeps on blessing this land. Here I sincerely appeal that eco-city of Zhongfang can be positioned as a world-class city of traditional Chinese medicine so that the amazing and beautiful Zhongfang will not only impress Hunan and China but impress the whole world. Western medicine culture has come into China for about 100 years, and it is getting to the highest point during these recent 30 years. It is widely respected that western medicine plays a crucial part in first-aid and operation, however, 70-80% of human diseases belong to chronic and common problems as well as frequently-encountered and difficult diseases. Since western medicine is on the basis of chemical substances and it results in side effects and white pollution to human body’s environment, modern people are getting more and more worried. Therefore people have very strong desire for the green and ecological concepts concerning air, water, food, environment, medical service and medicine. Under these circumstances, 5000-years history of Chinese medicine has come up to the stage once again with the big advantages of green and ecological effects. Now Chinese medicine has become all people’s expectation around the world. In order to improve our abilities to learn about and prevent diseases as well as increase self-protection, Beijing municipal government has declared that Chinese medicine will be added to the compulsory courses in all middle schools next semester. Chinese medicine is now on the way of comprehensive revival all over our country and what’s more the society gives more and more attention to TCM specialists. Some places having famous ancient TCM doctors such as Nanyang, Henan (hometown of medical sage, Zhang Zhongjin), Bozhou, Anhui (hometown of highly skilled doctor, Hua Tuo), Qichun, Hubei (herbal master, Li Shizhen) are rushing to build themselves as the city of Chinese medicine in China. However they cannot be constructed as a world-class city of TCM, for lack of international humanistic basis. But on the contrary, Zhongfang city is in a different condition. Our team of Zhongfang Red Cross International Hospital has received over 1000 international patients, TCM students and foreign friends from all over the world since our international TCM service team had been established in the year of 2000. Red Net reporter Feng Jun who was commissioned by the director of Red Net Mr. Shu Bin wrote an article on Dragon Boat Festival two months ago saying among about 2800 TCM hospitals in China, but there might be nearly no one using pure traditional Chinese medicine in its true sense. Zhongfang Red Cross International Hospital may be the first pure TCM hospital without using any western medicine. February 8, 2012 Mr. Kong Heping, the director of Hunan press office visited our hospital and he said there was no second one with such service performance in Hunan, even in the whole country he had never seen this kind of international TCM team. Mr. Kong Heping pointed that the long-term aim was to build our hospital to an important international publicity base of Chinese and TCM cultures in Hunan and even the whole country. Gao Decai, secretary-general of Hunan Friendship Association with Foreign Countries said at the 4th friendship association that the organization has received 2000 international friends within 8 years. He highly appreciated our team’s performance in international folk exchanges. Considering above 80% of international friends coming to our hospital in Huaihua, our hospital has been designated as foreigner management key unit by our foreign affairs office. More than 1000 international friends visiting predicts that the world-class city of TCM must be Zhongfang. Potential value of the geographical name “Zhongfang” is enormous. For example, some phrases related to ‘Zhongfang’ are very magnificent and easy to recite, such as ‘Chinese medicine lies in Zhongfang’, ‘The world TCM in Zhongfang’, ‘Zhongfang international TCM Forum’. These phrases are very easy to gain acceptance literally and phonetically. ‘Zhongfang and Zhong Yi (i.e. TCM)’ are matched as a union smoothly. Numerous cultural relics about the ancestor of Chinese nation Yan Emperor, also known as Shen Nongshi has been found in Lianshan Area, Huitong County nearby. Shen Nongshi set up Chinese agriculture firstly meanwhile he tasted hundreds of herbs and started traditional Chinese medicine. Shen Nongshi tasted various plants and herbs in the surrounding mountains. He left his footprints all around Zhongfang. From the viewpoint of TCM, medicine and food are of the same source. The contemporary Shen Nongshi in China, Mr. Yuan Longping is the father of my high school classmate Yuan Dingjiang. When I was a senior student, I often went to their home and Anjiang agricultural school for fun and observation. I was influenced greatly at that time. In Anjiang agricultural school, where is just 30 kilometers away from Zhongfang Mr. Yuan Longping achieved remarkable success on research of hybrid rice. This achievement is the pride of Chinese and is also the great support to people of the world. The hybrid rice feeds about 70 millions of people on the earth every year. Why it is a coincidence that both ancient and contemporary Shen Nongshi appeared in Zhongfang and the nearby area? We have to think about the uniqueness, namely, the geographical advantage of this piece of land. At present, Chinese herbal medicine cultivation also becomes an important industry in Zhongfang. We believe with the popularity of world-class city of TCM the local industry will be promoted and therefore all the people in Zhongfang will share the benefit. TCM flourishes in Zhongfang. After we had moved into the new hospital less than 15 days from Aug. 1st, 2010 a father from UAE brought his deaf son Faique to our hospital for TCM treatment. Faique has been suffering from total deafness for 18 years because of viral meningitis when he was 11 months old. Afterwards, the patient sought treatment around the world but without any help.After two weeks comprehensive TCM treatment the miracle appeared, that his left ear’s hearing was almost normal examined by doctors in the 535 Army Hospital. In addition, his right ear’s hearing was obviously improved as well. All our medical staffs were very glad to see the good results and his story became the news report on Huaihua TV. The miracle is rarely seen in international medical field. Mar. 18th, 2012 Dr. Walid, the father of a Jordanian patient wrote a letter to Chinese Red Cross Organization’s president Mr. Hua Jianmin, he expressed his appreciation to Chairman Hu Jintao, prime minister Wen Jiabao, Chinese medicine and our hospital for curing his daughter with 13 years systematic scleroderma. Because of 13 years of illness her muscular stiffness exists in many parts of her body and she tried lots of famous hospitals around the world but no effect. Happily that the patient was recovered 95% by staying at our hospital two and a half months together with one-month’s herbal medicine at home. Such an obvious effect impressed many international friends completely. There are too many successful cases to mention one by one and how big the international TCM market may never be known. Both Zhongfang and TCM are as flourishing as Davos and the World Economic Forum. With the card of ‘international TCM city’, it will definitely provide Zhongfang with some connotations of ecology, garden，environment protection，health, sanitation, civilization and internationalization. It is a big promotion to social and economic development in Zhongfang. The Medical Classic of the Yellow Emperor (also known as Huangdi Neijing), the earliest classical works on TCM is an important masterpiece named after our national ancestor the Yellow Emperor. This book wasn’t successfully translated into English language by Chinese person since it had been finished for 2000 years. Luckily, I became the first Chinese person who translated The Medical Classic of the Yellow Emperor. It took me eight years to complete the translation and that happened in Huaihua, a city only 15 kilometers far from Zhongfang. This book was published by Beijing Foreign Languages Press in the year of 2000 and it was promoted to more than 100 countries. Some time ago, the English version was collected in library of the University of California and it was also listed in Google world library. The Medical Classic of the Yellow Emperor has already become the important clinical reference to many foreign medical organizations. 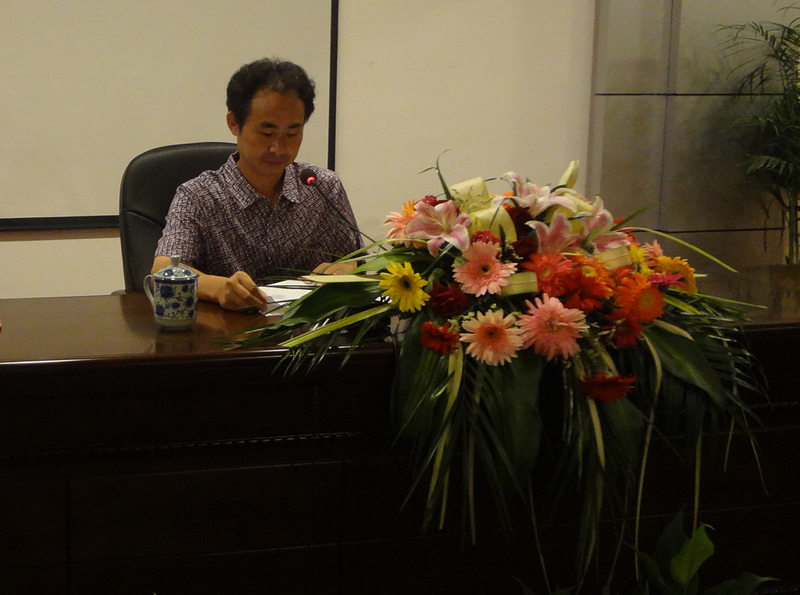 The success of the book’s translation is regarded as the root of our Zhongfang international TCM career. I still remember my 38-year-old birthday was just on December 24th, the Christmas Eve. Driven by curiosity, I looked through the calendar and found by coincidence that I was born on Christmas Eve in 1968. I can recall another what happened to me, that when I got university admission notice in 1986, but my expected major had been changed by a teacher. So my desired university was changed into Hunan TCM University from Hunan Agriculture University. I am still confused by these two matters so far. It seems like that I’ll be connected with god, yellow emperor, TCM and Zhongfang all my life. I believe all your readers are the excellent sons and daughters of our national ancestor yellow emperor. The heaven is about to place a great responsibility on you and of course you are the great persons arranged by yellow emperor. Hope you could interpret his eager anticipation and make joint efforts to promote this great career. The rise of TCM is our nation’s happiness and even good news to people around the world. My TCM team still can make some achievements with such a weak power. If the strong Zhongfang county government could set a wise orientation, make an overall plan and spare no effort to promote this career, why worry that the accomplishment doesn’t happen, Zhongfang couldn’t be a world pearl of health, Zhongfang couldn’t be rich, Chinese culture can’t flourish throughout the world? With great support of some people with wisdom, our land area is expanded to 200,000 square meters for further development. What’s more our hospital is named as Zhongfang TCM hospital given by county government. Now what we need to do next is improving hardware conditions, cultivating qualified personnel, decorating especially, increasing influence and extending steadily. Indeed it has a long way to go. Although we have to face many difficulties and hardships I strongly believe it is the darkness before dawn. In summary, becoming international TCM city is the will of the heaven, earth and people. Zhongfang is a favorable place for human health; it must be brilliant and lucky. I am deeply in love with this piece of land so I eulogize her and offer my proposal by my heart.